A few years back, I would join Christmas bazaars selling Thai food in a humble stall. The menu was very minimal. It consisted of Thai milk tea, green papaya salad (Som Tam) and Thai beef fried rice. This was with the help of my sister who was living in Bangkok during that time. When I would go down to the market near my sister's place in Bangkok, I would watch the vendors make Green papaya salad. The Som Tam (green papaya salad) vendors were quick and precise in their slicing and pounding all the ingredients in. The aroma was just as enticing too. This dish went perfectly with sticky rice and grilled meat for the times when we were too lazy to cook. Having said that, this recipe is close to my heart. My sister now lives in Seattle. As I let go of this special recipe to share it with you, I am excited to create new food memories with her in the near future! Place garlic, dried shrimp and chillies in a large mortar and pestle and pound on them for a few seconds. Add the palm sugar, fish sauce and lime juice into the mortar. Mix and pound the dressing until well combined and the palm sugar or brown sugar has dissolved. Add 2 Tbsp. roasted peanuts and the tomatoes into the mortar. Pound the mixture for about 30 seconds, lightly breaking up the tomatoes, and peanuts. No need to pound too hard. Last step is to toss the green papaya, string beans and carrots in. Mix it all together, doing a combination of using just a spoon and pounding lightly, but no need to pound hard. Make sure the dressing is coating all the green papaya and that the salad is evenly mixed. 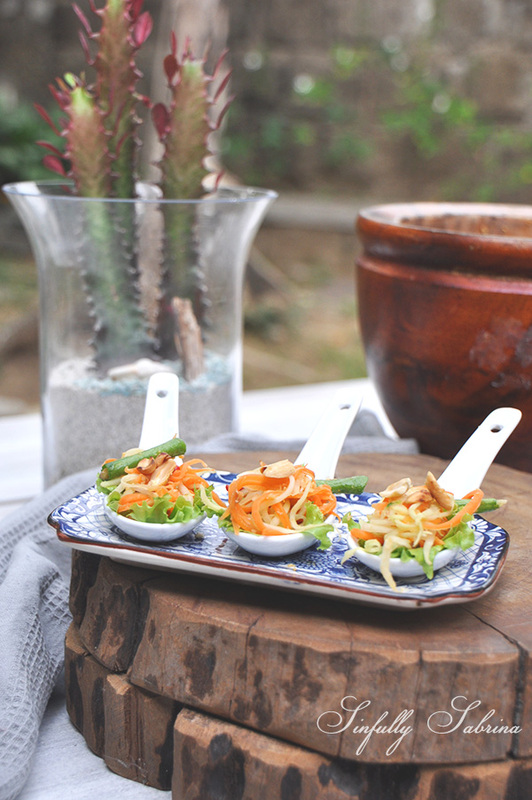 On a serving platter, place your lettuce on the bottom, pour the spicy papaya salad on top and sprinkle the roasted peanuts over. If you don't have a large mortar and pestle, use a small one to pound the garlic, chillies and dried shrimp and mix everything else in a metal or glass mixing bowl.